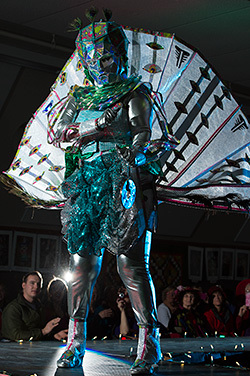 The 12th annual Valley Arts Alliance Wearable Art and Runway Fashion Show was performed at the Palmer Depot, with both a 3pm Matinee and a 7pm Evening performance. 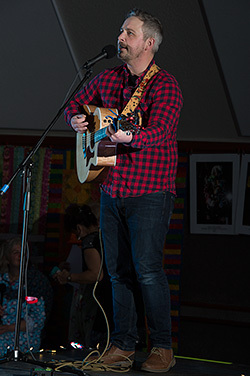 Both shows were opened by Adam Patterson. 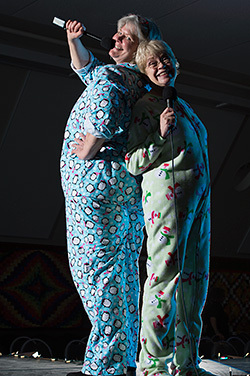 Pam Huyck and Becky McLaughlin served as Masters of Ceremony. Both performances were sold out! Angelina Klapperich made the top 15 for Miss America 2017 and won the Miss Congeniality Award during Nationals in Atlantic City. She is the second woman from Alaska to make the top 15; the first was about 30 years ago. She has spent the year immersing herself in the communities across the State as Miss Alaska, spreading awareness about her platform: " Be compassionate! Everyone fights a personal battle"
Angelina has been very active presenting her platform of compassion to hundreds of students throughout our Mat-Su school district, from elementary to area high schools. Angelina attended Palmer Middle school and is a graduate of Colony High and UAA. She is Alaska Grown, and lives in Wasilla. 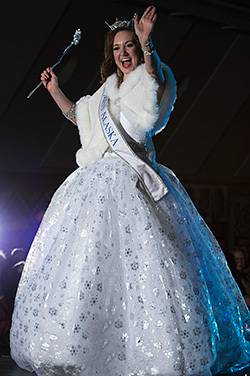 Today Angelina is wearing her ALASKA SNOW QUEEN dress she wore in the Miss America parade in Atlantic City! Why Blend-In When You Were Born To Stand-Out? 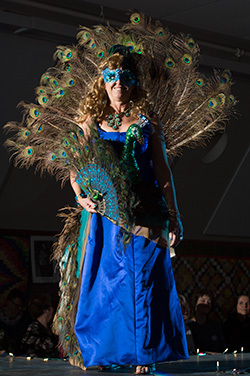 This peacock inspired dress is made out of many, many peacock feathers, jewelry and other glittery shiny things, things that peacocks like! No peacocks were harmed for this creation. Peacocks molt every year, and they happily donate their old feathers to Sandra, so all the feathers you see are recycled. The magical transformation of a person changing into a wolf. Also called a LYCANROC. This creature is one of Sierra’s Crystal Creatures that she designs and creates. Any children in the house? These cuties will be collecting teeth and leaving coins for the good girls and boys. 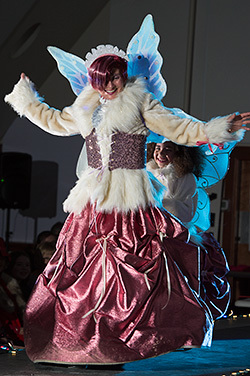 Remember to brush those pearly whites: the tooth fairies need them for their jewelry! Linda Lockhart created these beauties at her Top Drawer Studio-Thrift Store for the Big Lake PTO Trunk or Treat this past Halloween, to represent Dr. Knoxes dental practice. The fairies had so much fun there they wanted to come and see you, too . . . Don't forget to check under your pillow! This Asian-inspired Dragon Dress has scales like a dragon, made from over a thousand pieces of 4-inch fabric squares, which took years to collect! Colleen dedicated this performance to her two moms who passed away last year. Made from recycled plastic, organic material, and found metal scraps. Kali Boyer gave her 8th and 9th grade art students at American Charter Academy the opportunity to enter a creation for this year’s show. 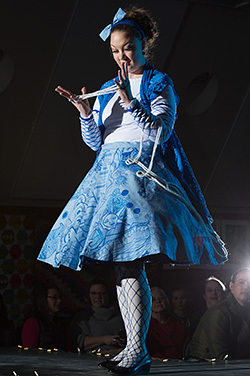 Seven of her students created the zentangles on the skirt; inspiration flowed as they drew with colored fabric pens. If Michele finds this universe too taxing, she can always “zen-out” by looking at the zentangles. She certainly may need to do so if the string art games she’s playing prove too taxing. Here is a last minute entry that just blew in like a tumbleweed off the Parks Highway. When she’s not fluttering about town, she hangs out in trees, swinging wildly from the branches. 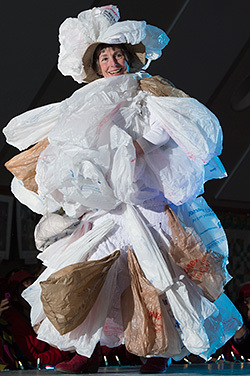 She’s out of control, especially in the windy Mat-Su, but if you can catch her, hang on tight and return her for recycling, either to the grocery store or to the community recycling center. She's a regular Outlaw in Wasilla! Mony a Mickle Makes a Muckle, a Scottish quote, translates to "Saving a small amount soon builds up to a large amount". You'll find in this design that's exactly what was done. 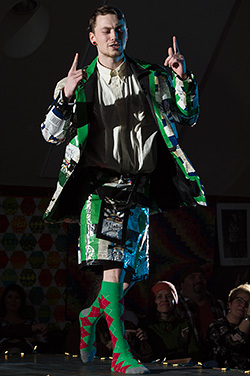 Welcome to an eccentric universe where even kilts can be made from recycled chip bags & other exciting items! This creation is sponsored by The Gathering Grounds Cafe in Wasilla, owned by My House. My House—supporting homeless youth by offering a hand up and not a hand out. Special thanks to the Alaska Chip Company for donating the materials. Two years ago these ladies graced the runway as The Three Graces. 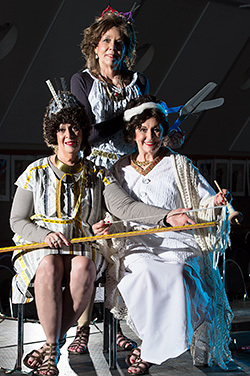 As fate would have it, the trio has again returned as goddesses: the Moirai (MOY rye), who are better known in English as the Three Fates. For those unfamiliar with these ladies, they are responsible for determining the length and course of mortal lives. First comes Cloth (KLOH tho) who is responsible for spinning the thread of mortal life. Dreaded Sister Atropus (AT roe poss) wields the shears that cuts the thread. 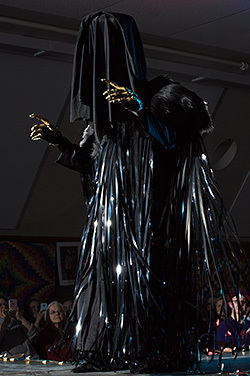 Each Fate is appropriately dressed with fabric dresses and accessories that depict her responsibility..
What to do with all the Valley Arts Alliance tickets collected over the past 12 years… Let’s send them all on a one-way ticket to Rome! 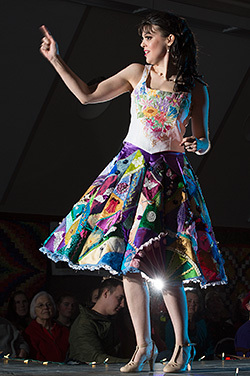 Ginny, in her omnipresent attempt to reduce her sewing supplies, opted for daughter Kate’s crazy quilt skirt. 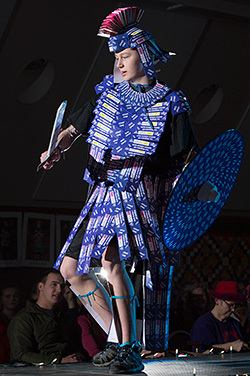 Several of the fabrics and trims were recycled from six previous Wearable Art ensembles. The embellishments of trims, lace, appliques, flowers, and buttons add “eye candy” to the skirt. Each gore contains flowers repurposed from Kate’s May 2017 wedding décor. Kate wore the hand embroidered silk on silk bodice at her wedding. Ginny, who learned that single thread silk takes hours to embroider, delights in the opportunity to repurpose and show off the bodice at another occasion where Kate walks “down an aisle”. What song could be more appropriate than “Crazy Little Thing Called Love” for such an ensemble? 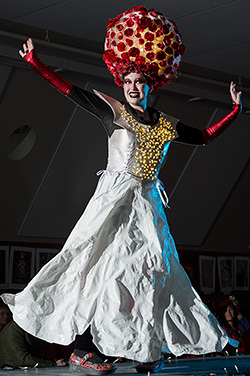 This up-cycled dress & bustle contains materials donated from all over our community. You can only imagine the stories each piece has acquired through time. With all these pieces put together they created a captivating step into another world. This creation is sponsored by the new Steam Driven Boutique in Wasilla. 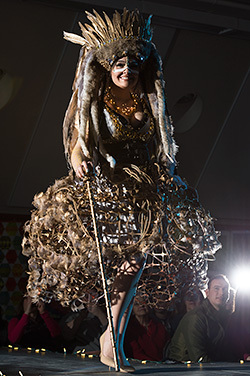 The Steam Driven Boutique offers youth the opportunity to upcycle clothing into Steam Punk designs. 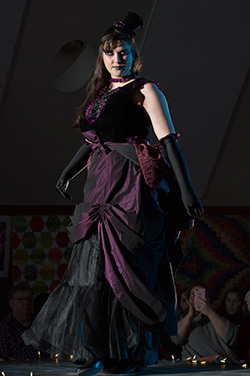 The Steam Driven Boutique is owned by My House in Wasilla. My House—supporting homeless youth by offering a hand up and not a hand out. A rather disturbing glimpse of the future as seen by Mr. Scrooge. It was this fearsome creature that made the old guy change his ways. Made of flat screen tv material, a water jug, faux fur and video tape, this is a re-cycled harbinger of a dim future—dim but recycled! 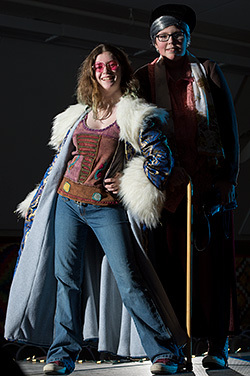 Designed at Top Drawer Studio-Thrift Store in Big Lake for the Valley Performing Arts production of A Christmas Carol which was directed by Cory Rausa. Don't miss the latest VPA production, Our Town now through March 4 at the VPA theater, and get tickets now for the highly anticipated musical Mary Poppins March 30 through April 22 at the Glenn Massey Theater. 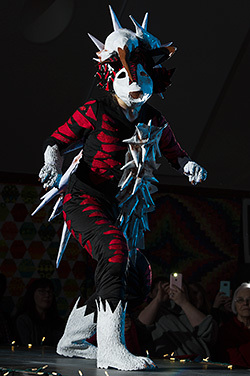 In Sandra’s Parallel Universe she would be a fiber artist: dying, spinning, knitting and weaving her own Avant guard clothing and dancing down a runway in Palmer Alaska. Wait—she is a fiber artist AND just happens to be in Palmer Alaska—what’s left to do? Just dance! Sandra has fashioned her sweater from handspun Shetland and merino wool. 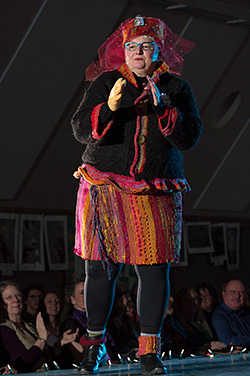 Her skirt is hand woven using her hand-dyed and handspun wool with the addition of sari silk. 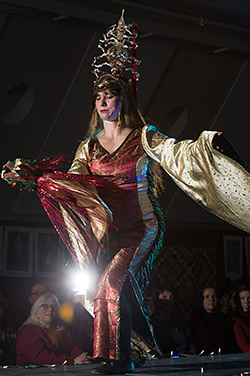 Her hat is sari silk and hand painted netting. Another spectacular T-N-T (Tarp-N-Tape) Creation by Niki. This Pea-Chick–instead of Peacock–is un-paralled in our universe! It is also an unflappable, “emotional support bird” for the creator of this outfit. Give me sand, give me sea, please let me be who I want to be. Inspired by snorkeling in tropical waters, Sandra is portraying a fish, swimming amongst the coral reefs. 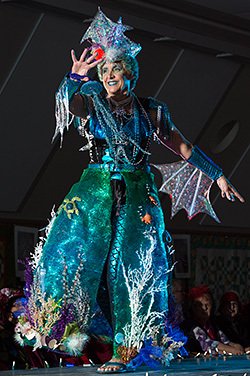 To make the skirt look like the ocean, Sinamay fabric was used. It is commonly used for hat making and ornaments. A spectacular flower is about to bloom with a beguiling glow! Venetian blinds, projector lamps, white tarp, yoga mats, plastic cups, hundreds of lights, custom wiring, batteries and a ton of glitter bring this "Flower of Linda's Imagination" to light. Special thanks to Talon Hill, John Cortney and John Erskine for their expertise and help with this piece. Sometimes people think I’m a little old lady. On the inside, I’m still 21. In our parallel universe, you can be whoever you want to be!